One day, I might finally decide that cheesecake is my most favorite dessert. The only factor holding me back is that the cheesecake makers of the world go wrong so frequently, but this cheesecake gets it right. My wonderful friend made it last year, and I was truly blown away. The pecans in this crust are so flavorful and unique that it stayed in my mind ever since. I finally made this cheesecake because (1) my friend is in Italy and I miss her so and (2) my kitchen now proudly houses a spring-form pan (yippee!). To make this cheesecake, start by removing 3 bricks of cream cheese from the fridge so they come to room temperature. While the cream cheese softens, make the crust. Melt 1/2 stick of butter, and let it cool. While the butter cools, add 5 graham crackers to a food processor and pulse them into fine crumbs. The crumbs should measure 3/4 cup. Then, add 1/2 cup of chopped pecans to the food processor, and pulse them so they blend in with the graham crackers. Next, add 1/4 cup of brown sugar and 1/4 cup of white sugar to the food processor, along with the cooled butter. Pulse everything together just so it is combined. Assemble a 9 inch spring-form pan, and pour the crumbs into it. Using your fingertips, press the crumbs into an even layer across the bottom of the pan and 1/2 inch up its sides. Put the pan in the fridge to chill for 1 hour. While the crust is chilling, make the cheesecake filling. To a medium bowl, add 1.5 cups of pumpkin purée, 3 eggs, 1/2 cup of brown sugar, 2 tablespoons of heavy cream, 1 tablespoon of bourbon, and 1 teaspoon of vanilla extract. Whisk the ingredients together until they are smooth, and then set them aside. To a large bowl (use the bowl of a stand mixer if you have one), combine 1/2 cup of white sugar, 1 tablespoon of cornstarch, 1.5 teaspoons of cinnamon, 1/2 teaspoon of nutmeg, 1/2 teaspoon of ground or freshly grated ginger (depending on how much you like ginger), and 1/2 teaspoon of salt. To the bowl, add the 3 bricks of room-temperature cream cheese. Using an electric mixer, beat the cream cheese on high until it is very smooth and well-combined with the other ingredients (about 2 minutes). Add the pumpkin mixture to the cream cheese mixture, and beat them together until they are fully combined. They will smell glorious. Preheat your oven to 350ºF. Then, once your crust has chilled for the full hour, remove it from the fridge and pour the cheesecake batter into it. Give the pan a jiggle so the batter evens out. Put the spring-form pan on a cookie sheet to catch any leakage, and bake the cheesecake for 50 minutes, rotating it half way through the cooking time for even browning. 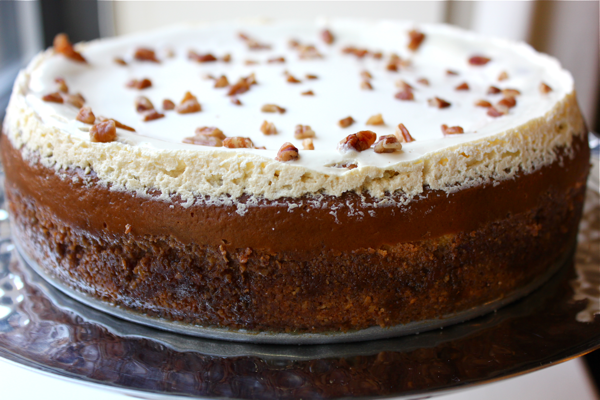 Once the 50 minutes are up, stick a toothpick into the very center of the cheesecake to see if it is set. If it is still wet, let it cook for a few more minutes, and then check again. Remove the cake from the oven, but leave the oven on. 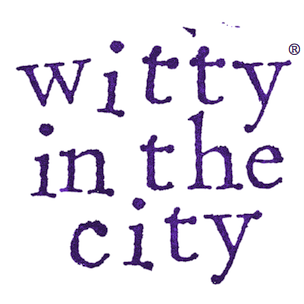 In a bowl, whisk together 16 ounces of sour cream, 1.5 tablespoons of white sugar, and 1 tablespoon of bourbon. Using an offset spatula, spread as much or as little of the sour cream as you like on top of the cheesecake. Even if you’re sour cream-averse, I strongly recommend adding it. The cheesecake is rich, and the slight sharpness and tang of the sour cream really cuts through and make the cake more balanced. 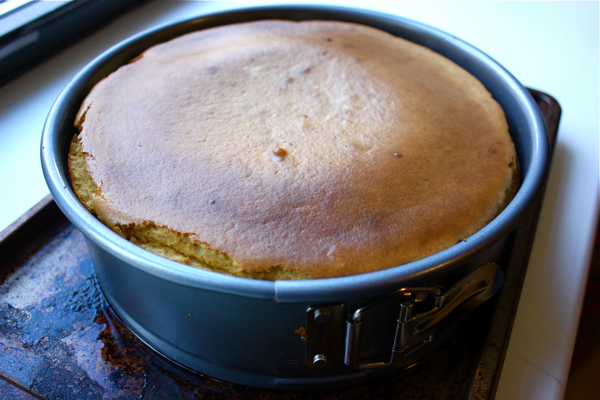 Once the sour cream is on, bake the cake for 5 more minutes. Then, sprinkle over some chopped pecans for a garnish. Keeping the cheesecake in the spring-form pan, set it to cool on a rack for about 3 hours. Then, cover the top of the pan with plastic wrap, and chill the cheesecake in the fridge for at least 4 hours or overnight. When you’re ready to serve the cheesecake, pop the sides of the spring-form pan off, slice, and serve. My absolute favorite part of this cheesecake is the crust. The pecan flavor is prominent and mellow, and the whole crust is caramelized and delicious. 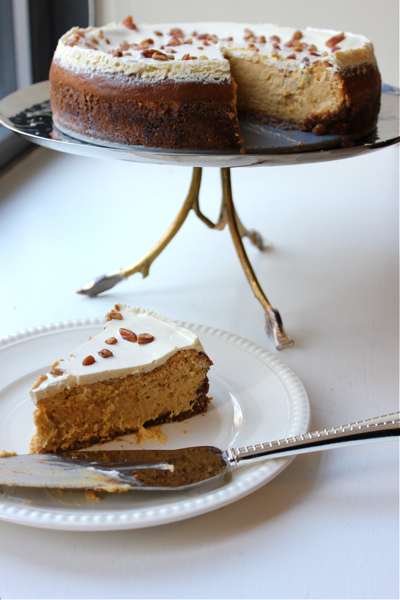 It’s the most perfect base for a very creamy and fall-flavored cake. Does the Cheesecake Factory make this cake yet? They should! 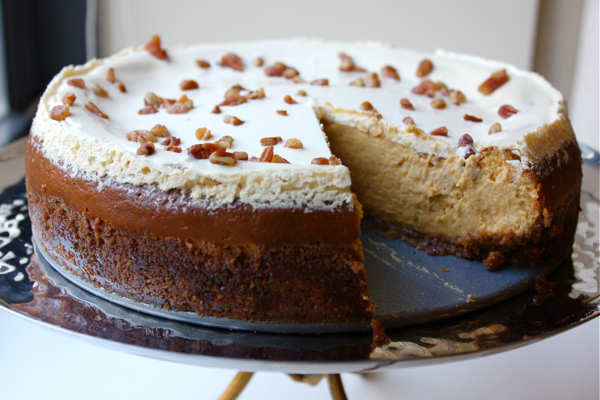 This recipe is from Smitten Kitchen: bourbon pumpkin cheesecake. This looks delicious!!! Do you deliver?? I made this incredible cheesecake over the weekend and it is by far the most amazing, complex flavor and textured cheesecake I have ever made. It gets 5 stars. I’m so glad you made it and enjoyed! If you have any cheesecake left over, it freezes and thaws incredibly well.